As a consistent top producer licensed in 2003 and now a Principal Broker, Mel really enjoys selling real estate whether it is a fine home, fixer with potential, ocean view lot, historic farm or large wild tracts of land! Mel works hard & smart for her clients and especially with integrity, guiding them through real estate sales or purchases with solid experienced advice. Mel also enjoys beach walking, hiking, camping, biking, gardening and tending her backyard flock of chickens! 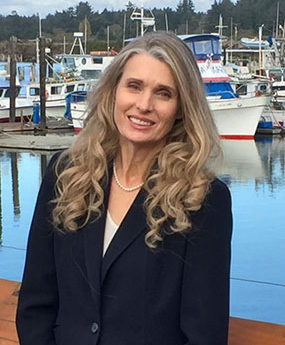 Mel resides in Bandon and adores the scenery, lifestyle and seafood of the Oregon Coast. Besides selling real estate she spends her time with her large extended fun loving family, enjoys lots of dancing including ballet on pointe, jazz and lyrical and ballroom on Saturday nights (Treasurer, BOBDA, Bandon Ballroom Dance Association). Mel enjoys continually learning to be of greater value to her clients & has achieved many continuing education designations including CRS, Council of Residential Specialists, SRES, Senior Real Estate Specialist, SRS, Seller Representative Specialist & the National Association of Realtors’ GREEN Designation. “Mel helped my mom sell her house a few years ago & more recently she helped us sell a piece of property. Mel is always friendly, professional and proactive. We’ve enjoyed working with Mel and hope our paths cross in the future. As we were located 1300 miles away from our target destination, we needed the help of a professional who was experienced in the south Oregon coast where we wanted to purchase our properties for both residential and commercial purposes. We researched realtors in the south coast area and after reading reviews of several realtors, we decided to contact Mel Garrett. We found her to be very responsive and professional. She made it a priority to help us quickly due to our limited time frame we had scheduled to fly into the area. We looked at seven properties located in three different towns. Through her professionalism, we acquired two separate properties with guidance from her as to the negotiation process with the sellers. She even provided an impromptu virtual tour of one of the finalist properties. She is very knowledgeable in the critical areas associated with living in a coastal climate; such as specialized roofing requirements, building conditions and local economic trends, as well as the complexity of a 1031 Exchange process. She is very well connected and we found the home inspector she referred to be very knowledgeable, friendly and competitively priced. She worked closely with the title company to ensure the process was completed within our timeframe. She cares greatly about her clients and even after the closing process, she still contacts us to make sure everything is going well. We highly recommend Mel Garrett and will utilize her services again in the future. “Mel tells it like it IS!! She answered or promptly responded to any & all questions. My wife & I were so pleasantly surprised & grateful for accurate posting of property photos & Property descriptions by Mel. She successfully negotiated our purchase and we have recommended her to all of our family & friends for Oregon Coast purchases! “Mel helped sell my parent’s home in Bandon Oregon. She did a great job with it and I would highly recommend her as a Realtor. She is very well known in the area and can help you with all of your real estate needs. “When I decided to make a change and buy property in Bandon, it was accidental that I chose Mel. What was an exciting venture was made much easier and less stressful because of her expertise. When we found that the seller had withheld some important information, Mel handled the situation expertly, and helped us negotiate to a solution that both parties could agree on. Throughout the transaction, Mel performed with a level of integrity beyond reproach. “Our experience working with Mel was first-rate from start to finish. Mel impressed us with her combination of local knowledge, process involvement, and superior communication skills. Mel has our highest recommendation! Omega Green Farms, Bandon OR 97411) We were very fortunate to find Mel Garrett our Real Estate Agent, with so much experience and willingness to work hard to locate a house with some acreage as we wanted. The task was difficult since we were in need of a special place that could fill out our project needs. Mel dedicated a big portion of her time searching for the best type of property. She did a great job in finding the best site to satisfy our needs. We are very happy with the results and we highly recommend Mel for her professionalism and attention to details!